In a medium skillet, sautÃ© shallot, sausage and mushroom stems until sausage is cooked and liquid evaporated. Scrape mixture into a bowl and combine with blue cheese, cream cheese, brandy and thyme. In same skillet, melt butter over medium heat. 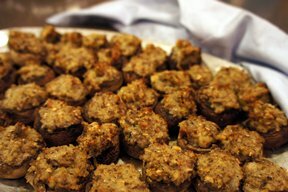 Immediately remove from heat and toss mushroom caps in melted butter until well coated. Arrange caps stem-end up on a baking sheet and mound about 2 teaspoons sausage filling in each. 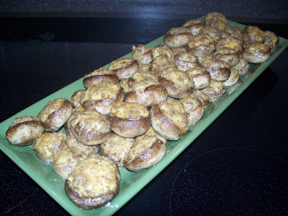 Bake until cheese is bubbly and mushrooms are tender but still hold their shape, about 10 minutes.